AFRICA/SOUTH SUDAN - A missionary says: "father, why did God allow me to be born in South Sudan?" 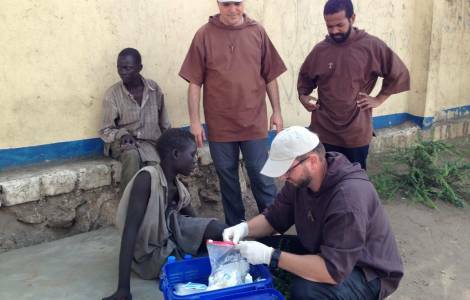 Juba (Agenzia Fides) - "I arrived in South Sudan in Juba in January 2015, where we have the only home of the Friars Minor of the country. At the beginning we were 5 friars, two from Italy, one from Slovakia, Australia and the United States. Together we manage a fairly large parish that includes villages distant up to 75 km from the capital". This is how the story of Father Federico Gandolfi, a missionary of the Friars Minor of Juba begins. "Among our activities we are committed to offering an open, peaceful, non-violent space where those who come to us have the opportunity to find a corner of serenity within such a difficult life. The biggest drama of these people is the lack of a future, unfortunately there are not many hopes and this situation is slowly stopping a new generation of young people who would give anything to leave the country but who are too poor to become refugees and migrants. Someone also asked me: 'father, why did God allow me to be born in South Sudan?' This is a question which has no answer.